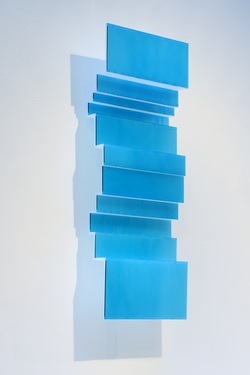 London based artist Kate Maestri specialises in the innovative use of contemporary architectural glass. She works in collaboration with architects and engineers across a wide range of site specific projects on large scale glass installations. She also works on smaller scale architectural glass sculptures for exhibition. Her work explores the use of structural and three-dimensional stained glass. The intent is to create an environment in which the colour, light and form of sculptural glass works in harmony with the architecture. Her recent exhibitions include Collect Open at the Saatchi Gallery and a solo show at Contemporary Applied Arts Gallery, London. Her public art commissions include an award winning glass installation at Portman Square, London with architects Jestico & Whiles, and a large scale glass installation for the Sage Music Centre, with architects Foster & Partners.